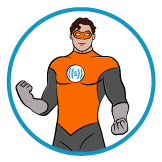 With Sirenum’s advanced staff management platform, your staff turns into Wonder Workers. Wonder Workers are safer, more engaged, and less likely to leave. They arrive on time more regularly, and their clients are happier with both them and your agency. 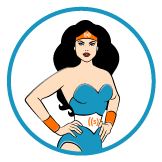 Sirenum enables innovative and profitable agencies to make their staff feel like they’re on Themyscira. Fill the form to find out more about how your staff can become Wonder Workers. 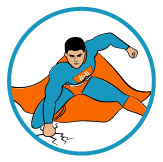 What could your operations teams do with a team of Super Schedulers? Would they leap tall buildings in a single bound? Maybe, but not because of Sirenum’s industry-leading scheduling engine. But it would help Super Schedulers build and manage schedules faster than a speeding bullet–at least 50% faster, reducing time-to-fill by up to 80%. Super Schedulers also help ensure that your clients always have the right person at the right place at the right time. 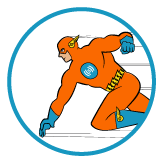 Kinda like another superhero in blue… Fill out the form to learn more about how Sirenum Scheduling can fill your teams with Super Schedulers. Mobility rocks and App Girl knows it. Her superior training and knowledge is one reason why. MySirenum is another. 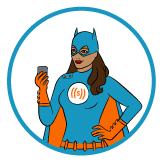 App Girl knows that MySirenum can help her find work where and when she wants it. MySirenum also helps App Girl check in and out when she’s on a shift. It even helps her find out what her next paycheck is going to look like. With MySirenum, App Girl never has to worry about taking dark vengeance. Fill out the form to find out more. Monitoring the health and wellbeing of your staff is no easy task. You need a corps of people shining their lights on your workforce wherever they go. With Sirenum Monitoring, no evil shall escape your team’s sight. Whether it’s geofencing to ensure your workers are in the right place or support for lone worker and patrol, your team of Orange Lanterns have the tools to protect your staff while delighting your clients. Other time and attendance tools are limited to punching in and now–they’re no match for Sirenum Monitoring. To learn more about how we help you develop a team of Orange Lanterns, fill out the form.